The detention of the deposed Catalan president Carles Puigdemont in Germany has sparked a new wave of protests back at home. Pro-independence supporters are taking to the streets all across Catalonia to demand his release, with some protesters even blocking the main streets of Barcelona, as well as major highways. The protests are organized by the Committees in Defense of the Republic (CDR), a series of decentralized local groups set up in the run-up to last October’s independence referendum, in order to counter the Spanish police attempts to dismantle the preparations for the vote. Some thousand people answered the CDR’s call to block one of the most crowded highways in Catalonia on Tuesday morning. 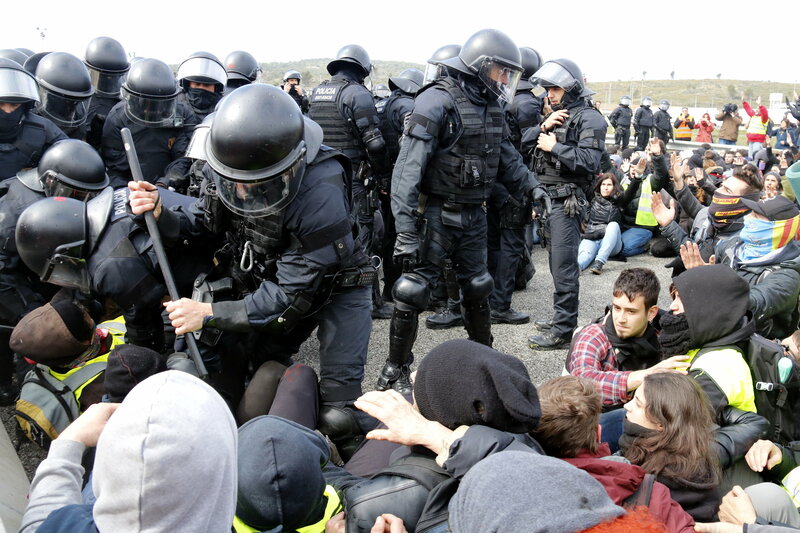 The AP-7, a motorway running along the Mediterranean coast and connecting Catalonia with France (north) and Valencia (south), was blocked at 6 am in Figueres, close to Girona. The Catalan police removed protesters by noon, with some officers charging the demonstrators. Some 50 police vans were dispatched to the spot in order to proceed with the operation. While traffic goes back to normal in the AP-7, some major highways remained blocked by demonstrators for hours before police intervened. The N-340 was flooded by protesters near Alcanar, the southernmost town in Catalonia. The N-11, near the French border, was blocked too. The people blocking the AP-7 motorway came from all over the local area and arrived prepared. Many wore hats and balaclavas, and came with water and sandwiches, with some people even putting up tents on the road. The protest began with unveiling a banner that read: 'Organized and mobilized, let’s make the Republic effective. Freedom for the political prisoners'. The CDR asked people to continue joining the “24-hour” protest and to make it longer if possible. However, the organization stressed that the protest is “peaceful”. According to the CDR, more than a thousand people blocked the motorway at three points, both north and south, and at the toll at exit 3. Many protesters were dressed in hi-visibility vests and carrying Catalan independence flags, blocking the way with tires. One group from Taradell (Osona), who preferred not to be identified out of fear of legal repercussions, said they had decided to come because “the politicians do nothing and we must take to the streets to make Carles Puigdemont president,” they said.